What will Elon Musk's impact be on agriculture? This is what I kept thinking after reading his biography by Ashlee Vance (Elon Musk: Tesla, SpaceX, and the Quest for a Fantastic Future) and, although the only part about agriculture was a brief period in Musk’s life working on a family farm in Canada, I think there is a lot agriculture can learn from entrepreneurs like Musk. PayPal was a rethinking of traditional banking. Musk was one of the earlier pioneers to recognize that financial transactions had moved digital, but personal banking remained analog. Tesla, though originally the brainchild of Martin Eberhard, took on new significance when Musk invested heavily and subsequently took control (albeit not without controversy). Tesla’s cars are not just all electric, but rolling computers that are capable of being remotely summoned and semi-autonomous driving. Tesla’s cars are a rethink of the automobile. SpaceX was a reboot of the space program. Since the 1960s, any one who wanted to get a satellite into space had to use aerospace giants (think Boeing, NASA), which were still building rockets like they had since the 1960s. SpaceX has made “low cost” commercial space possible. 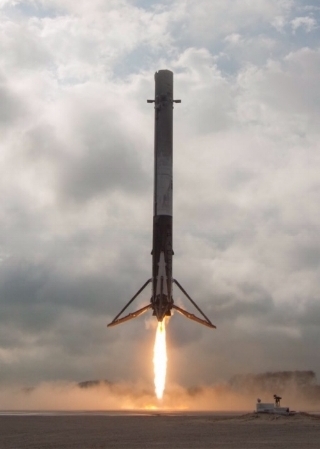 SpaceX booster lands for re-use after launching a Falcon 9 rocket. Any of these efforts could still fail, but after reading the book, I don’t think they will. The book portrays Musk as a dichotomy. At times, Musk's brilliance allows him to see things that other practical-minded people can't. But this same way of thinking often makes Musk blind to those around him. The book describes multiple instances where he fired long-standing employees because they challenged his vision, or perhaps pointed out a flaw in Musk’s approach to something. The author describes Musk as a cross of Bill Gates and Steve Jobs, having Gates' ingenuity and Job's relentless attention to detail. Vance's Elon Musk a great book if you like reading about entrepreneurs or corporate histories. My conclusion is that agriculture is ready for Musk (or someone else) to enter the stage. So many things on the farm represent a slow gradual evolution of older technologies. Musk rethinks common technologies and reinvents them from the ground up. John Deere's all-electric tractor concept replaced the diesel engine with an electric battery pack, but otherwise the tractor was the same. Something tells me a Tesla tractor would be something entirely different. If you read the book, please drop a comment or send me an email with your thoughts.